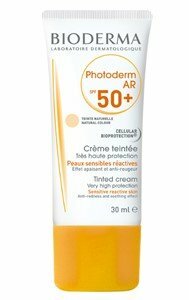 Photoderm AIR spf50 +, Color Cream inhibits the action of the causative factor of redness, masks and reduces redness, thanks to its Patented Rosactiv, containing powerful active ingredients anti-redness that help prevent diffuse redness or the propagation of the same. The natural tone of AIR Photoderm results perfectly on clear skin. Evens the skin tone, and minimizes redness.